To Cite: Bahrami N, Bayat M, Farzin A, Sadredin Hajseyedjavadi M, Goodarzi A, et al. The Ability of 3D Alginate/Polyvinyl Alcohol Cross-Linked Hybrid Hydrogel to Differentiate Periodontal Ligament Stem Cells Into Osteoblasts, Arch Neurosci. Online ahead of Print ; In Press(In Press):e85118. doi: 10.5812/ans.85118. Porous alginate/polyvinyl alcohol hybrid scaffolds have been extensively used in cartilage, bone, and dental tissue substitute applications. However, its mechanical and osteogenesis properties are not good enough to meet the requirement for use in hard tissues repair applications. In this study, to achieve the best mechanical and physical properties, we carried out the cross-linking of PVA physically and alginate chemically. Hydroxyapatite nanoparticles (nHA), the important component of hard tissues, was added to the hydrogel to improve its mechanical properties and osteoconductivity. The results showed that the fabricated alginate/polyvinyl alcohol-nHA scaffold has around 81% interconnected porosity, hydrophilic surface with the contact angle of water on the surface in the range of 38 ± 0.29°, 3.51 MPa compressive strength, and a degradation rate of 71%. The periodontal ligament stem cells (PDLSCs) culture results showed that both fabricated alginate/polyvinyl alcohol hybrid scaffolds with and without nHA had good cell attachment ability and could promote PDLSCs ingrowth. The real-time RT-PCR assay showed that the presence of nHA in the alginate/polyvinyl alcohol hybrid scaffold could significantly accelerate the expression of specific markers of pre- and mature osteoblast stages such as osteocalcin, alkaline phosphate, and osteopontin genes. These results showed that alginate/polyvinyl alcohol hybrid scaffolds with hydroxyapatite nanoparticles can be used in bone and dental substitute applications as osteoconductive and reinforcement components. In recent years, alginate scaffolds have been widely employed to regenerate and repair damaged tissues and release drugs because of their excellent hydrophilicity, biocompatibility, and gelation ability (1, 2). However, the alginate with a brittle network does not have good adhesion to cells and cannot induce cells attachment. To overcome this problem, polyvinyl alcohol (PVA) has been incorporated into the alginate structure (3, 4). PVA is a U.S. Food and Drug Administration (FDA) approved polymer with a high degree of hydrolysis and no degradation at room temperature (5). It has been reported that the combination of synthetic PVA polymer and alginate natural polymer would lead to enhanced cell adhesiveness and physically stable scaffolds (3). However, the chemical composition and mechanical properties of alginate/polyvinyl alcohol hybrid scaffolds are not good enough to be used as bone tissue substitutes (6). Hydroxyapatite (HA, Ca10(PO4)6(OH)2) as a significant component of the bone structure is mixed with alginate and PVA suspension to improve its mechanical properties, biocompatibility, and osteoconductivity. In this study, we fabricated porous alginate/polyvinyl alcohol/nano-HA hydrogels by the modified freeze-drying method. The mechanical, physical, and cellular behaviors of alginate/PVA scaffolds have been tailored for bone tissue engineering applications. Furthermore, periodontal ligament stem cells (PDLSCs) differentiation into osteoblast cells was assessed in the presence of the fabricated scaffolds. The nanostructured hydroxyapatite (nHA) powder was prepared by the sol-gel method (7). Briefly, 0.5 mol of phosphorus pentoxide (P2O5, Sigma Aldrich) was dissolved per liter of absolute ethanol (Merck, Germany). Separately, 0.5 mol of calcium nitrate tetrahydrate (Ca(NO3)2.4H2O, Sigma Aldrich) was dissolved per liter of absolute ethanol. A mixture of Ca/P (in a mole ratio of 1.67) was obtained by the homogenous mixing of the two prepared solutions. The solution was left at ambient temperature for 24 h to obtain a transparent solution. Next, the obtained gel was dried at 80°C. Then, the gel was heat treated (heating up to 600°C at a rate of 5°C/min for 0.5 h, followed by cooling down at ambient temperature). The obtained powder was ball-milled with zirconia vial and balls the capacity of vial and diameter of balls were 125 mL and 20 mm, respectively). A solution was prepared to contain 2% (w/v) sodium alginate (biochemical grade, molecular weight = 398, Sigma Aldrich, USA) dissolved in distilled water under magnetic stirring at room temperature. Separately, 10% (w/v) polyvinyl alcohol (PVA, hydrolysis 99%, molecular weight = (30 - 50)×103, Sigma Aldrich) was dissolved in distilled water under magnetic stirring at 80°C for 12 h. The same volume of the two solutions was uniformly mixed together at ambient temperature for 24 h. The synthesized nHA was added to the PVA/alginate solution at the concentrations of 1% (w/v) and stirred at room temperature for 12 h to obtain a homogenous solution. Then, the solution was poured in 12-well plates. Physical cross-linking of PVA in the mixture was done by the modified freeze-thawing method (8). In this way, the well plates containing alginate/PVA/HA solution were exposed several times to the freeze-thawing cycle without using any cross-linking agent that are toxic to cells. To do this, the solution in wells was exposed several times to freezing and thawing at -40°C and 5°C, respectively. By this method, the original shape of the mixture gel disk was kept and any harmful crosslinking agent was removed. After that, the disk shape of alginate-PVA-HA hydrogel was immersed in 2% (w/v) CaCl2 solution to chemically crosslink the alginate. The disks were washed three times with water and finally freeze-dried (Telstar, Spain). The apparent and total porosity of the fabricated scaffolds were measured using the water displacement principle using the Archimedes method (ISO standard 39231/1-1979(E)) (9). where W1, W2, and W3 are the weight of dry scaffold, wet scaffold when it was removed from the water after 24-h soaking, and soaked scaffold in the water, respectively. To evaluate the wettability property of the fabricated scaffolds, the sessile drop technique was used. In this method, the fabricated scaffolds were placed under the needle of a contact angle measurement machine. A distilled water droplet was placed on the surface of the scaffold. The contact angle of the formed water droplet on the surface was measured by Image J software (Image J 1.40 g). Each experiment was repeated three times. The compressive strength of the prepared scaffold was evaluated by Instron 5542 machine tester (Norwood, MA, USA). The surface and pore morphologies of the fabricated scaffold were observed by scanning electron microscopy (SEM, Philips XL30: Eindhoven, The Netherlands). where W1 and W2 are the weights of the scaffold before and after soaking in the solutions, respectively. To evaluate the cellular behavior of the fabricated scaffolds, PDLSCs (extracted from the mature human teeth) were used. Briefly, after washing the intact teeth by phosphate buffered saline (PBS), periodontal ligaments were scraped from the root area. The obtained tissues were rinsed several times with PBS, crushed to small pieces, and put in an incubator at the temperature of 37°C and in the atmosphere containing 5% CO2. After reaching 80% confluency, the cells were cultured in DMEM containing 10% (v/v) FBS, 100 units/mL of penicillin, and 100 mg/mL of streptomycin and were kept in a humidified incubator for further experiments. Cell culture experiments were carried out by seeding 1×104 PDLSCs on the surface of each prepared scaffold in a 96-well plate using DMEM + 10% (v/v) FBS + 100 unit/mL penicillin + 100 µg/mL streptomycin. These experiments were performed in a humidified incubator. The media were refreshed every 48 h. The cytotoxicity and viability of the cultured cells on the fabricated scaffolds were evaluated by 3-(4,5-Dimethylthiazol-2-yl)- 2,5-Diphenyltetrazolium Bromide (MTT) assay kits (Sigma-Aldrich, St. Louis, USA) according to the manufacturer’s instructions. The experiments were carried out three times for each group and the absorbance was read by an Awareness Technology microplate-reader. Sterilized fabricated scaffolds were placed in 24-well plates and 2 × 104 cells were seeded in each well. The media containing DMEM/F12 + FBS 10%, 50 μg/mL ascorbic acid, 10 nM dexamethasone, and 10 mM β-glycerol phosphate were added to each well for 21 days to encourage the differentiation of PDLSCs. The media were replaced by fresh ones every three days. The effects of the fabricated scaffolds on the expression of four main bone-related genes including osteopontin, collagen I, osteocalcin, and alkaline phosphate (ALP) were evaluated by the real-time reverse transcription (RT) polymerase chain reaction (RT-PCR). After 21 days of PDLSCs culturing on the surface of scaffolds, samples were washed using PBS. A Qiazol reagent kit was used to isolate the total RNA pursuant to the manufacturer’s instruction. Next, cDNA was fabricated by an M-MLV reverse transcriptase kit. The obtained cDNA was exposed to quantitative RT-PCR. The targeted gene expression was measured by SYBR-Green (TAKARA, USA). The used primer sequences are presented in Table 1 for osteonectin, collagen I, osteocalcin, and ALP. Abbreviations: ALP, alkaline phosphate; COL (I), collagen I; OCN, osteocalcin; OPN, osteopontin. After 21 days of osteoblast-like cells induction, the particular markers in differentiated cells were detected by immunocytochemistry (ICC) experiment. First, the cells were fixed by 4% paraformaldehyde (Sigma-Aldrich). Then, the cells were permeabilized using 0.2% Triton-X100 (Sigma-Aldrich) for 30 min, followed by blocking with 5% bovine serum albumin in PBS. After 45 min, the cells were incubated overnight with primary antibody collagen I (mouse monoclonal AB; Abcam,1:200) and osteonectin (Rabbit Monoclonal AB; Abcam, 1:200). A secondary antibody (Alexa Fluor@488 donkey anti-mouse IgG and Alexa Fluor@594 donkey anti-rabbit IgG diluted at 1:500; Abcam) was used for one hour. After each step, the slides were cleaned with PBS and the staining of nuclei was carried out using 4',6-diamidino-2-phenylindole (DAPI, Sigma). Cells were examined by fluorescence microscopy (Olympus BX51, Japan). All experiments were repeated three times and the mean ± standard error of the mean was reported. Two-way ANOVA was employed to analyze the data. Significant differences were shown as *P < 0.05, **P < 0.01, and ***P < 0.001. The scanning electron microscopy images of the prepared alginate/PVA scaffold without and with hydroxyapatite nanoparticles are presented in Figure 1A and B, respectively. The pore sizes of the scaffolds were in the range of 120-140 µm and 110-130 µm for alginate/PVA and alginate/PVA/nHA scaffolds, respectively (analyzed by Image J). As can be seen, the incorporation of nHA did not affect significantly the pore size of alginate/PVA scaffolds. The SEM images confirmed the pore interconnectivity for both samples. Hulbert et al. (10) showed that the minimum pore size suitable for an osteoconductive scaffold is 100 µm. As shown, both the prepared scaffolds had proper pore sizes in order to use in hard tissue engineering applications. Table 1 shows the mechanical and physical properties of the prepared alginate/PVA and alginate/PVA/nHA scaffolds. As can be seen, the compressive strength of alginate/PVA scaffolds increased from 1.91 ± 0.15 MPa to 3.51 ± 0.42 MPa. Poor mechanical properties of alginate/PVA scaffolds limit its application as a hard tissue substitute or filler. Gibson and Ashby showed that spongy bone had the compressive strength in the range of 0.2 - 4 MPa (11). To eliminate the stress shielding phenomenon, the mechanical properties of implanted scaffolds and near tissues should be similar. As can be seen, the compressive strength of the fabricated scaffolds and spongy bone fall in the same range. As shown in Table 2, alginate/PVA and alginate/PVA/nHA scaffolds had the interconnected porosity of 82.3 ± 1.2% and 80.4 ± 1.6%, respectively. The incorporation of hydroxyapatite nanoparticles reduces the amount of interconnected and total porosities of alginate/PVA scaffolds. This leads to the improved mechanical properties of alginate/PVA scaffolds. Contact angle measurements were performed to evaluate the effect of nHA on the wettability of alginate/PVA scaffolds. As can be seen in Table 1, the hydrophilicity of the alginate/PVA surface increased by adding nHA (the contact angle of alginate/PVA scaffolds decreased from 41° ± 0.46 to 38° ± 0.29). The hydrophilic surface of alginate/PVA/nHA can lead to cell attachment, proliferation, and differentiation. Figure 2 shows the degradation rates of alginate/PVA scaffolds with and without nHA soaked in DMEM and DMEM + FBS solutions. As can be seen, both prepared scaffolds had higher degradation rates in the DMEM + FBS medium. 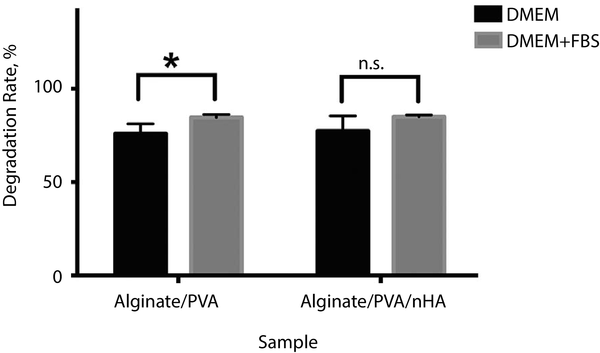 After incorporation of nHA, the degradation rate of alginate/PVA scaffolds increased significantly (P = 0.05). However, the degradation rate of alginate/PVA/nHA scaffolds did not show any significant difference in DMEM and DMEM + FBS solutions. As shown, both prepared scaffolds met the requirements of degradable scaffolds in order to use in tissue engineering applications. Figure 2. The degradation rate of alginate/PVA scaffolds with and without hydroxyapatite nanoparticles soaked in DMEM and DMEM + FBS solutions. Figure 3 shows the morphology of PDLS cells cultured on alginate/PVA and alginate/PVA/nHA scaffolds after seven days. As shown, cells spread on the surface perfectly (marked by orange arrows). These images also show that the cells attached and grew on the surface of both samples with normal spherical shapes and their surfaces were obviously covered by the cells on day 7. These results certainly show that both fabricated alginate/PVA and alginate/PVA/nHA scaffolds are safe and biocompatible. Figure 4 shows the result of MTT assay of fabricated alginate/PVA and alginate/PVA/nHA scaffolds, as well as the control sample (only cells + media), after three, five, and seven days of cell culturing. As can be seen, there are no significant differences in the cell viability between the control and alginate/PVA or alginate/PVA/nHA samples on day 3. By increasing the culture time up to five days, the optical density of alginate/PVA/nHA scaffold was significantly higher than that of the control sample (P < 0.01). The fabricated alginate/PVA/nHA scaffold not only did not have any negative effects on the PDLS cells, but also could promote cell ingrowth. These results strongly show that the fabricated alginate/PVA/nHA samples are biocompatible and could induce cell growth and viability. Figure 4. The viability of PDLS cells exposed to alginate/PVA and alginate/PVA/nHA scaffolds after three, five, and seven days. The osteogenesis ability of fabricated alginate/PVA and alginate/PVA/nHA scaffolds was evaluated through real-time RT-PCR and ICC analysis. The main osteogenic gene markers were detected. The morphological images of PDLSCs exposed to differentiating media and cultured on Petri dishes show that they changed to long and spindle-shaped osteoblast-like cells (Figure 5A). 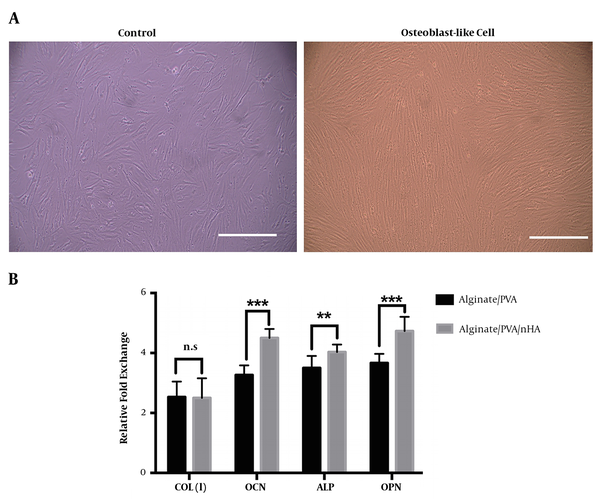 The expression of osteocalcin, alkaline phosphate, and osteopontin genes was significantly higher in differentiated cells seeded on alginate/PVA/nHA scaffolds than those seeded on alginate/PVA scaffolds (Figure 5B). These results obviously show that nHA had significant positive effects on osteoconductivity and bone defects repair. Figure 5. (A) Morphological changes of control and differentiated cells after 21 days (scale bar: 100 μm). (B) mRNA expression of osteoblast-like cells derived from PDLS cells seeded onto alginate/PVA and alginate/PVA/nHA samples after 21 days. 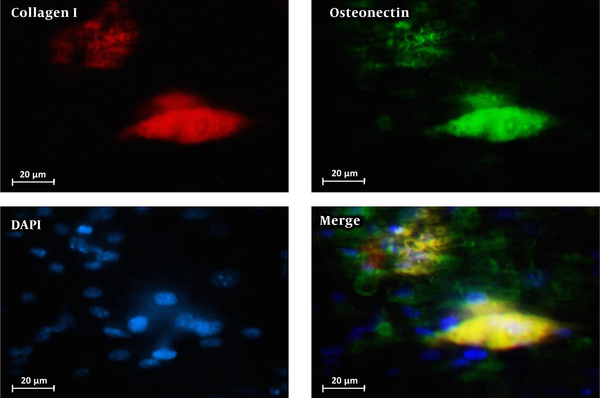 The results showed significantly higher expression of osteocalcin, alkaline phosphate, and osteopontin markers in differentiated cells exposed to alginate/PVA scaffolds with hydroxyapatite nanoparticles. (n.s. : non-significant difference, *P < 0.05, **P < 0.01, and ***P < 0.001). Figure 6 shows the immunocytochemistry staining for collagen I and osteonectin performed on PDLSCs cultured on alginate/PVA/nHA scaffolds. As can be seen, PDLSCs differentiated to osteoblast-like cells successfully during culturing in the differentiation media. These results show that the fabricated alginate/PVA scaffold with hydroxyapatite nanoparticles is osteoconductive and can be used in bone and cartilage tissue engineering applications. Scaffolds are porous materials that ideally should have a suitable level of biodegradability, high amount of interconnected porosity, good mechanical properties, and a hydrophilic surface for cell attachment and differentiation. These properties of a scaffold ultimately facilitate the regeneration of tissues. In this study, we concluded that fabricated alginate/PVA/nHA scaffolds have good properties of an ideal bone substitute scaffold and they are strongly recommended in bone tissue engineering applications. In this survey, we fabricated alginate/PVA/nHA hybrid scaffolds with enhanced cell compatibility, improved surface wettability, and enhanced mechanical properties by the modified freeze-drying method in order to use in bone tissue engineering applications. The results showed that fabricated alginate/PVA/nHA scaffolds have ~80% interconnected porosity with the pore sizes in the range of 110 - 130 µm. The results were compared with alginate/PVA scaffolds fabricated in the same condition. The alginate/PVA/nHA hybrid scaffolds had higher mechanical strength than the control alginate scaffolds without significant differences in porosity and wettability. The samples with HA nanoparticles showed higher cell viability than the samples without HA nanoparticles. The results showed that alginate/PVA/nHA scaffolds can significantly promote the periodontal ligament stem cells differentiation into osteoblasts. We suggest scaffold alginate/PVA with hydroxyapatite nanoparticles as osteoconductive and reinforcement compounds in bone tissue engineering applications. Authors' Contribution: All authors contributed according to the arrange in manuscript. Ethical Considerations: We had no in-vivo experiments. All data had been gotten in Tehran University of Medical Sciences. Funding/Support: We had no grant support, funding sources or provision of equipment and supplies. 1. Wee S, Gombotz WR. Protein release from alginate matrices. Adv Drug Deliv Rev. 1998;31(3):267-85. [PubMed: 10837629]. 2. Pawar SN, Edgar KJ. Alginate derivatization: A review of chemistry, properties and applications. Biomaterials. 2012;33(11):3279-305. doi: 10.1016/j.biomaterials.2012.01.007. [PubMed: 22281421]. 3. Cho SH, Oh SH, Lee JH. Fabrication and characterization of porous alginate/polyvinyl alcohol hybrid scaffolds for 3D cell culture. J Biomater Sci Polym Ed. 2005;16(8):933-47. doi: 10.1163/1568562054414658. [PubMed: 16128229]. 4. Bendtsen ST, Quinnell SP, Wei M. Development of a novel alginate-polyvinyl alcohol-hydroxyapatite hydrogel for 3D bioprinting bone tissue engineered scaffolds. J Biomed Mater Res A. 2017;105(5):1457-68. doi: 10.1002/jbm.a.36036. [PubMed: 28187519]. 5. Saavedra YG, Mateescu MA, Averill-Bates DA, Denizeau F. Polyvinylalcohol three-dimensional matrices for improved long-term dynamic culture of hepatocytes. J Biomed Mater Res A. 2003;66(3):562-70. doi: 10.1002/jbm.a.10583. [PubMed: 12918039]. 6. Sun J, Tan H. Alginate-based biomaterials for regenerative medicine applications. Materials (Basel). 2013;6(4):1285-309. doi: 10.3390/ma6041285. [PubMed: 28809210]. [PubMed Central: PMC5452316]. 7. Fathi MH, Hanifi A. Evaluation and characterization of nanostructure hydroxyapatite powder prepared by simple sol–gel method. Mater Lett. 2007;61(18):3978-83. doi: 10.1016/j.matlet.2007.01.028. 8. Yonese M, Baba K, Kishimoto H. Viscoelastic properties of poly(vinyl alcohol)/alginate snake-cage hydrogels and interpenetrating hydrogels. Polymer Journal. 1992;24(4):395-404. doi: 10.1295/polymj.24.395. 9. Iso E. Biological evaluation of medical devices-part 5: Tests for cytotoxicity: In vitro methods. German version EN ISO. 1999. 10. Hulbert SF, Morrison SJ, Klawitter JJ. Tissue reaction to three ceramics of porous and non-porous structures. J Biomed Mater Res. 1972;6(5):347-74. doi: 10.1002/jbm.820060505. [PubMed: 4116127]. 11. Gibson LJ, Ashby MF. Cellular solids: Structure and properties. Cambridge University Press; 1999.